If you are ever roaming around the streets of NYC and spot that pastel yellow Ice cream truck, you have come across Van Leeuwen's. With flavors like salted caramel bourbon, and Tahitian vanilla, it is clearly obvious why this has become one of my favorite ice cream stops in the city! Here I tried the dark chocolate chip mint which was seriously amazing! Can't wait to try more flavors this summer. Hope you all are having a lovely start to your week! Such a gorgeous photo of you!! Love the dress, it's so romantic! Super cute outfit! And this ice cream looks delicious! That looks like the best ice cream van in the world! Cute outfit! Your giving me a sweet tooth! mmm salted caramel bourbon sounds delicious! you look lovely, love the little floral headband. Mmm.. I used to go to the Van Leeuwen ice cream shop in Cobble Hill, Brooklyn. So tasty! This post made me hungry! You look adorable. I absolutely love your crochet dress! Love your dress. you look adorable. This is making me hungry. Now dreaming of ice cream! Ice cream looks yummy but your accessories are yummier! Your instagram pics always make me crave icecream & cupcakes... I must try Van Leeuqens next time I see them. Love your dress, it's so simple but perfect! And yummy I want an ice cream now. Btw, I just followed you, and you are so lucky, you live in NYC! I wish I lived there too. Hope you have time to check out my blog. aww! you look ubber cute! i'm so inlove with that dress! cute dress! fits perfectly on you! oh wow! this sounds definitely like something I should try as soon as I´m in NYC! Oh what a cute post! Which program are you using to write on your photos? Thank you! ahh I was in the city yesterday and the amount of ice cream trucks is insane! the salted caramel is killer looking. what a pretty dress and headband you have on! Just discovered your blog via instagram - love your photos! Nothing beats icecream during the Summertime. Cute headband. ice cream in a hot day is such a bliss! Love your flower headpiece - so nice and summery! Yum- icecream!! 1. I love how romantic and whimsical your outfit is today. 2. Omg. SALTED CARAMEL BOURBON ICE CREAM? 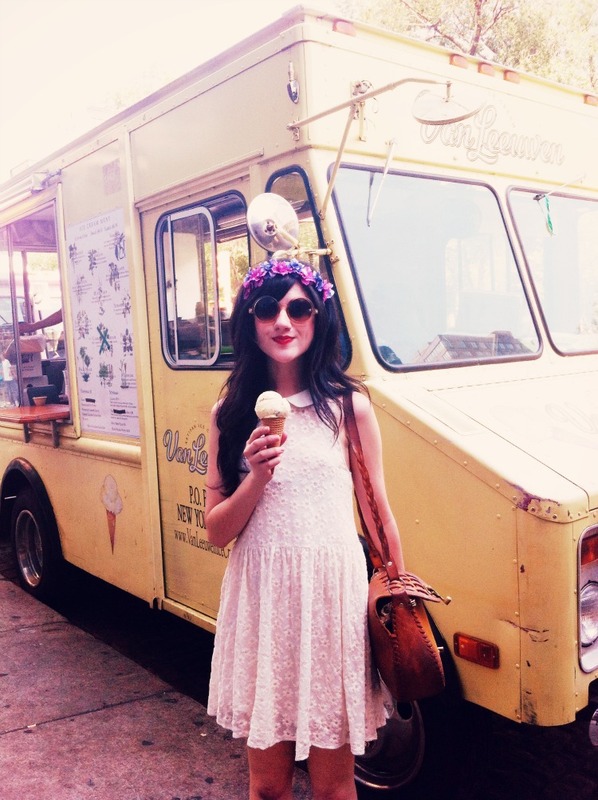 Nice cute chic dress and the Ice creams mouthful. I tasted it once too.